There are several ways to reach our hotel both from the Airport and the Port of Piraeus: by bus, metro or taxi. Take the Express Bus No 95 to Syntagma Square (Terminal/last stop). Airport Express Bus fare = 5 euros per person. Take the Metro Blue Line No 3 to Monastiraki. As you exit the station, turn around to leave the station towards the smaller Miaouli Street. Turn right onto Miaouli Street and follow it until the square Platia Iroon. Cross the square to Ag. Anargiron Street. 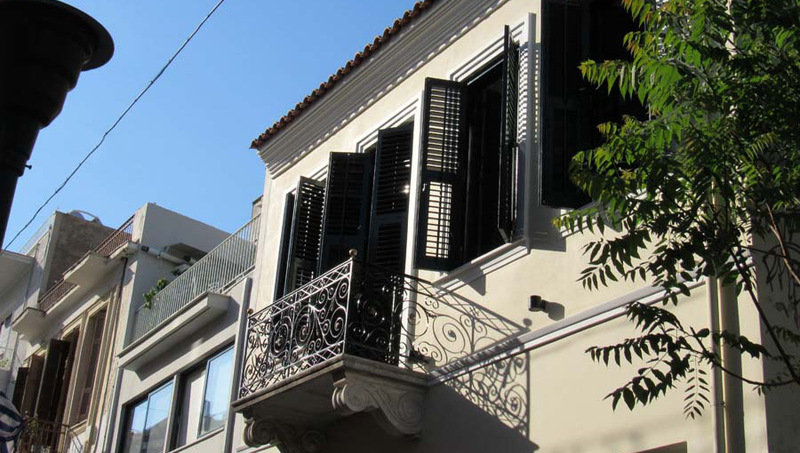 Kerameion Hotel is number 7, the fourth building on your left, within view of the square. Airport Metro fare = 10 euros per person (18 euros for two persons). Should you exit Monastiraki Station via the wrong exit, do not worry:Exiting the station onto the square, turn left. Cross the square keeping the square on your right hand side. Cross Ermou Street into Miaouli Street. Follow Miaouli until you reach the hotel. Taxi fare varies between 40-60 euros depending on luggages and the time of day. Take the Metro Green Line No1 to Monastiraki. Exiting the station onto the square, turn left. Cross Ermou Street into Miaouli Street and follow it until the square Platia Iroon. Taxis are available at the port. Taxi fare varies between 20-40 euros depending on luggages and the time of day. Call us now and make your reservation! Created with ♥ by Passion4Design 2018 © All rights reserved.